Who put Bella in the Wych Elm? is graffiti which first appeared in 1944 following the 1943 discovery of the skeletonised remains of a woman by four children inside a wych elm in Hagley Wood, Hagley (located in the estate of Hagley Hall), in Worcestershire, England. The victim—whose murder is approximated to have occurred in 1941—remains unidentified, and the current location of her skeleton and autopsy report is unknown. On 18 April 1943, four local boys (Robert Hart, Thomas Willetts, Bob Farmer and Fred Payne) were poaching or bird–nesting[n 1] in Hagley Wood, part of the Hagley estate belonging to Lord Cobham near to Wychbury Hill when they came across a large wych elm. [n 2] Thinking the location to be a particularly good place to hunt birds' nests, Farmer attempted to climb the tree to investigate. As he climbed, he glanced down into the hollow trunk and discovered a skull. At first he believed it to be that of an animal, but after seeing human hair and teeth, he realised that he had found a human skull. As they were on the land illegally, Farmer put the skull back and all four boys returned home without mentioning their discovery to anybody. However, on returning home, the youngest of the boys, Willetts, felt uneasy about what he had witnessed and decided to report the find to his parents. When police checked the trunk of the tree they found an almost complete skeleton, with a shoe, a gold wedding ring, and some fragments of clothing. The skull was valuable evidence, in that it still had some tufts of hair and had a clear dental pattern, despite some missing teeth. After further investigation, the remains of a hand were found some distance from the tree. The body was sent for forensic examination by Prof. James Webster. He quickly established that it was that of a female who had been dead for at least 18 months, placing time of death in or before October 1941; Webster also discovered a section of taffeta in her mouth, suggesting that she had died from suffocation. From the measurement of the trunk in which the body had been discovered, he also deduced that she must have been placed there "still warm" after the killing, as she could not have fitted once rigor mortis had taken hold. Police could tell from items found with the body what the woman had looked like, but with so many people reported missing during the war, records were too vast for a proper identification to take place. They cross-referenced the details they had with reports of missing persons throughout the region, but none of them seemed to match the evidence. In addition, they contacted dentists all over the country since the dentistry was quite distinctive. In 1944 a graffiti message, related to the mystery, appeared on a wall in Upper Dean Street, Birmingham, reading Who put Bella down the Wych Elm - Hagley Wood. This led investigators down several new leads tracing who Bella could have been. Other messages in the same hand appeared too. 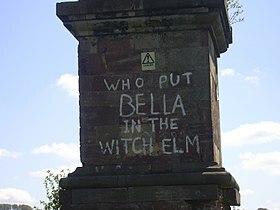 Since at least the 1970s, the graffiti has sporadically appeared on the Hagley Obelisk near to where the woman's body was discovered, which asks the slightly modified Who put Bella in the Witch Elm?. An episode of the television programme "Nazi Murder Mysteries" described a forensic facial reconstruction undertaken by the University of Liverpool's "Face Lab", from photographs of the skull. It was commissioned by Andrew Sparke, for his books on the incident. In a Radio 4 programme first broadcast in August 2014, Steve Punt suggested two possible victims. One possible victim was reported to the police in 1944 by a Birmingham prostitute. In the report, she stated that another prostitute called Bella, who worked on the Hagley Road, had disappeared about three years previously. The name “Bella” (or “Luebella”) suggested the graffiti artist was probably aware of the identity of the victim or of the killer. A second possibility came from a statement made to police in 1953 by Una Mossop, in which she said that her ex-husband Jack Mossop had confessed to family members that he and a Dutchman called van Ralt had put the woman in the tree. Mossop and van Ralt met for a drink at the Lyttelton Arms (a pub in Hagley). Later that night, Mossop said the woman became drunk, and passed out while they were driving. The men put her in a hollow tree in the woods in the hope that in the morning she would wake up and be frightened into seeing the error of her ways. Jack Mossop was confined to a Stafford mental hospital, because he had recurring dreams of a woman staring out at him from a tree. He died in the hospital before the body in the wych elm was found. The likelihood of this being the correct explanation is questioned because Una Mossop did not come forward with this information until more than 10 years after Jack Mossop's death. Another theory comes from an MI5 declassified file about Josef Jakobs - the last man to be put to death in the Tower of London on 15 August 1941. An Abwehr agent, he parachuted into Cambridgeshire in 1941 but broke his ankle when landing and was soon arrested by the Home Guard. On his person was found a photo purportedly of his lover, a German cabaret singer and actress named Clara Bauerle. Jakobs said that she was being trained as a spy and that, had he made contact, she may have been sent over to England after him. However, there is no evidence that Clara Bauerle was parachuted into England, and several witnesses describe that Clara Bauerle was around 6 ft (180 cm) tall, while Bella was 5 ft (150 cm). In September 2016, it was determined that Clara Bauerle had died in Berlin on 16 December 1942. In 1945, Margaret Murray, an anthropologist and archaeologist from University College London, proposed a more radical theory - witchcraft - where the severed hand was consistent with a ritual called the Hand of Glory, after Bella had been killed by gypsies during an occult ritual. Her ideas excited the local press and led investigators to consult another seemingly ritualistic killing of a man, Charles Walton, in nearby Lower Quinton. In 1953, another theory surfaced, namely that Bella was a Dutchwoman named Clarabella Dronkers, killed by a German spy-ring consisting of a British officer, a Dutchman and a music hall artist, for "knowing too much." Available records and evidence were unable to support the story. ^ The Independent named the species as "wych–hazel", an old synonym for the same kind of elm. 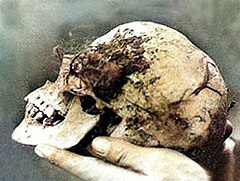 ^ a b c d e f g h "Who Put Bella in the Wych Elm?, Series 7, Punt PI - BBC Radio 4". BBC. Retrieved 2018-01-16. ^ a b BBC staff (12 August 1999). "Murder mystery returns to haunt village". BBC News. Retrieved 30 July 2010. ^ a b Askwith, Richard (18 August 1999). "Mystery. Murder. And half a century of suspense". The Independent. Retrieved 30 July 2010. ^ a b c d Vale, Allison (2013-03-22). "Is this the Bella in the wych elm? Unravelling the mystery of the skull found in a tree trunk". The Independent. Retrieved 27 February 2014. ^ a b "Does graffiti hold the answer to this 73-year-old murder mystery?". NewsComAu. Retrieved 2018-01-17. ^ a b c d "Who put Bella down the Wych Elm?". Strange Remains. 2015-04-24. Retrieved 2018-01-17. ^ Joyce M. Coley, Bella: An Unsolved Murder (Studley, Warwickshire: History into Print, 2007), p.9. ^ "Nazi Murder Mystery". Yesterday Channel. Retrieved 6 December 2018. ^ "Who Put Bella In The Wych Elm". Nazi Murder Mysteries. Series 1. Episode 4. 6 December 2018. Yesterday Channel. ^ a b Holder, Bev. "Image of Hagley Wood murder victim Bella revealed for first time". Stourbridge News. Retrieved 6 December 2018. ^ a b "Clara Bauerle Declassified". Josef Jakobs 1898-1941. Retrieved 2018-01-19. ^ "Clara Bauerle Finally Laid to Rest". Josef Jakobs 1898-194. Retrieved 2018-01-19. Sparke, Andrew (2018). Who Put Bella In The Wych Elm? : Volume 1: The Crime scene Revisited. CreateSpace. ISBN 978-1984288813. Sparke, Andrew (2018). Bella In The Wych Elm: Volume 2: In Search Of... CreateSpace. ISBN 978-1-985207-66-0.